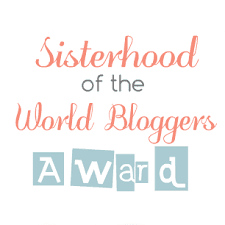 Star Girl from The Nights Writer's Diary, nominated me for the Sisterhood of the World Bloggers Award. Thank you! To accept this award, I have to answer Star Girl's ten questions. I decided, that instead of answering them in a blog post, as normal, I'd make a video. I look forward to hearing your answers to my questions! 1.If you could be a book character, which one would you be and why? 2. If you could have any super power, what would it be? 3. What city would you like to visit? 4. Where would you go in a time machine? 5. If you were an ice cream what flavour would you be and why? 6. How would you describe yourself in three words? 7. What kind of music would you be? 8. If you were a colour, what would it be and why? 9. What type of chocolate is your favourite? 10. Which Greek God is your favourite? Sorry it took me so long to answer these questions. It's was the summer holidays over here and we were away. But this award was a lovely surprise when I got back. Thanks Sophie for nominating me! I've never been nominated this award before..thank you! How are you? I've missed your blog posts/videos! You are so amazingly sweet that I walk away smiling every time I read your blog. God Bless you Sophie! Thank you so much! We went away on holiday a week ago, so I haven't had much time to write, but I'm back now and I'm looking forward to writing more posts. I can't wait to see your answers! Thanks for nominating me! :D I can't wait to do this! Um, I haven't been getting updated with your posts..it's something with the feeds. Could you perhaps put a follow by email thing on the sidebar of your blog so I could still get your posts? Thanks! I think it's a problem blogger is having at the moment! Sure thing. I'll add that now. Sorry about that. I love how you put your own twist on this and answered the questions in a video. I loved your answers. Thank you for nominating me, I had a lot of fun answering the questions! HI I just found your blog, we have a lot in common, Australian!!! big family, photographers and writers, I just thought that is pretty cool! Thanks for visiting my blog! I love finding people who have thing in common with me. Awesome video! I'll answer them ASAP. How did you get the 'you might also like' gadget at the bottom of your posts? I've looked but can't find how! Thank you! I can't wait for your answers.